The vegetation of fossil ape and human sites is central to long-standing theories for the evolution of upright stance. "The hands and arms could hardly have become perfect enough to have manufactured weapons, or to have hurled stones and spears with a true aim, so long as they were especially fitted to climbing trees''' (Darwin 1872). Other ideas are that grasslands selected for upright stance because of the need to be vigilant against predators (Dart 1926), to manipulate small seeds (Jolly 1970), to minimize exposure to the sun (Wheeler 1984), or to cover long distances with less energy by walking (Rodman and McHenry 1980) or running (Bramble and Lieberman 2004). Wooded grasslands and open woodlands are also plausible sites for evolution of upright stance from squat feeding on the ground (Kingdon 2003) or moving between scattered fruiting bushes (Sanford 2003). Alternatively, upright stance may have evolved in forests because it allowed erect-back climbing (Tuttle 1981), hands free to care for premature infants (Lovejoy 1981), phallic display to females (Tanner 1981), or intimidation displays to rivals (Jablonski and Chaplin 1993). Paleosols are relevant to these questions because the fine root traces and crumb structure of grassland soils are distinct from the thick clayey subsurface horizons of both woodland and forest soils (Jenny 1941). Woodland and forest soils differ markedly in their clay minerals and chemical composition (Retallack 1997). Even the aquatic theory of human origins (Morgan 1982) can be evaluated from paleosols because mangal, littoral, lake margin, and streamside paleosols are distinguished by virtue of relict bedding and common burrows of crabs and clams (Retallack 2001). Paleoclimate also is of interest as a selective pressure on hominoid evolution through drought and other hardships. Paleoclimate was also a primary control of past vegetation in which hominoids found food and shelter. 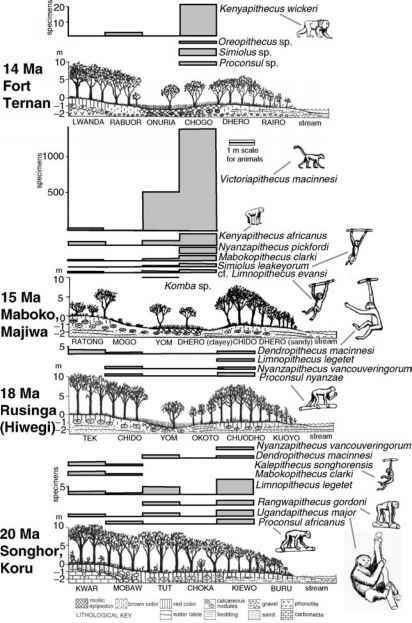 Paleoclimatic shifts to drier climate and more open grassy vegetation have been held responsible for major evolutionary innovations in hominoids and bovids (Vrba 1999), as have changes in degree of climatic variability (Potts 1996). Soils of dry climate have calcareous nodules at a shallower depth than soils of humid climate (Retallack 2004) and also are less leached of cationic nutrients (Ca2+, Mg2+, K+, Na+) than humid-climate soils (Sheldon et al. 2002). Paleosols can thus provide paleocli-matic records at the very sites of early human ancestors rather than inferred from remote records of deep-sea cores (de Menocal 2004). This review emphasizes climate and vegetation, but other soil forming factors of parent material, topographic position, and duration of soil formation can also be inferred from paleosols. Highly calcareous and saline carbonatite volcanics are an unusual parent material of many African hominid sites (Retallack 1991a), fortunate because of their remarkable preservative effects for fossil bones, seeds, and insects (Retallack et al. 1995). Many East African paleosols preserve a record of well-drained fluvial terraces, infrequently flooded, and some volcanic apron paleosols represent foothills environments (Retallack 1991a), thus revealing environments beyond the usual lowland constraints of sedimentary environments. Degree of soil development can also be used to infer duration of paleosol formation and rates of sediment accumulation, with implications for the geochronology of ape and human ancestor sites (Retallack et al. 1995, 2002).